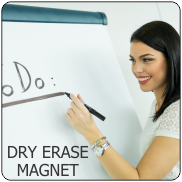 Our flexible magnet products can be cut to any size or shape. Magnetking makes the job easy with our high speed digital die cutting table. Precise cuts can repeated over and over. Unlike traditional die cutting, there is no die charge or waiting several days for die production. We can cut any shape you need from any of our products. 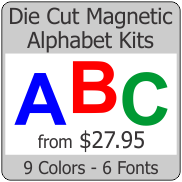 Alphabet letter kits and common precut shapes are our most popular. If you don't see what you're looking for below, pleae call for a quote.